Rajasthan, is a colourful state in Western India with warm people and hot food. Colourful, not only because of the blue city and the pink city but if you also look at the clothing of the people and the food of Rajasthan you will find brilliant, bright colours all around. The variety of dishes and recipes that come from this Princely State, with its arid climate and limited vegetation, is remarkable. It has a rich culinary heritage that Indians are proud of and that foodies from all around the world patronise. 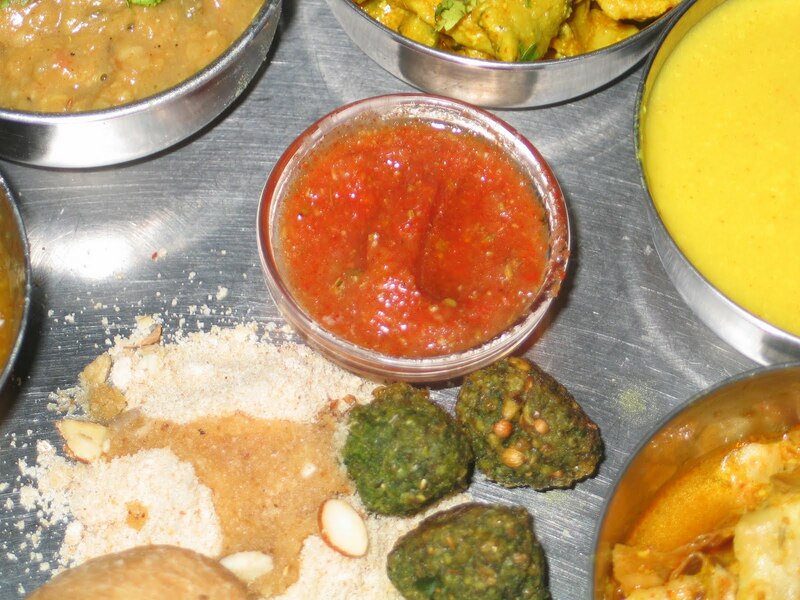 The distinguishing factor about Rajasthani food is that due to limited vegetation, the food from Rajasthan is dominated by lentils and grains rather than vegetables. In most of the curries you will notice the use of grains and lentils in different forms. Rajasthani food also uses a lot of ghee (clarified butter) and chilli, making the food very hot yet satisfying. The great thing about cooking Rajasthani food at home is that you can alter the quantity of chilli as per you preference, I wouldn’t alter the quantity of ghee in the food though, that would just take all the fun out of Rajasthani food. Yesterday I decided to cook up a Rajasthani thali, it took me all day to try, taste and improve to make it taste how it should taste. I faced a lot of practical challenges in some recipes which seemed so easy at first. I will discuss these challenges and how to overcome them as we go along my trail of recipes. So here is the rajasthani thali. I hope you will enjoy it! I loved the papad ki sabzi and so did my family. It is really simple to make and great to taste. You can use your favourite papad and just cook up something yummy in a matter of minutes. The best part about this recipe is that I did not face any challenges in making it, it is surprisingly simple and really boosted my confidence in cooking up an authentic Rajasthani meal. So, be fearless and take your first, baby step to Rajasthani cooking with Papad Ki Sabzi. Toast or deep fry the papads and break them into bite size pieces. They can be broken in uneven shapes, be sure not the crush them or break them into very tiny pieces. Keep them aside. In a pan heat ghee, once ghee is hot, add in asafoetida (hing), Cumin (Jeera) and stir, allow the cumin to change into a darker colour. Now, add in the coriander seeds and fry them in ghee for a minutes. In a bowl, mix in the yogurt (dahi) with four tablespoons of water and all the dry masalas, turmeric, red chilli powder, cumin powder, garam masala powder and salt. Mix them well. Add the flavoured yogurt to the pan with the rest of the masalas. Allow this mixture to cook on a low flame for three to four minutes. Stir from time to time. Add in the broken pieces of papad and stir them in the curry. The papad tends to absorb some of the moisture. Cook the sabzi for two minutes on a low flame. Stir from time to time. Serve hot with Missi Roti or any other Indian bread. Nearly every community in India prepares kadhi with a distinct signature mixture of spices; Gujarati Kadhi, Punjabi Kadhi, Sindhi Kadhi to mention a few in the wide array of the Kadhis. 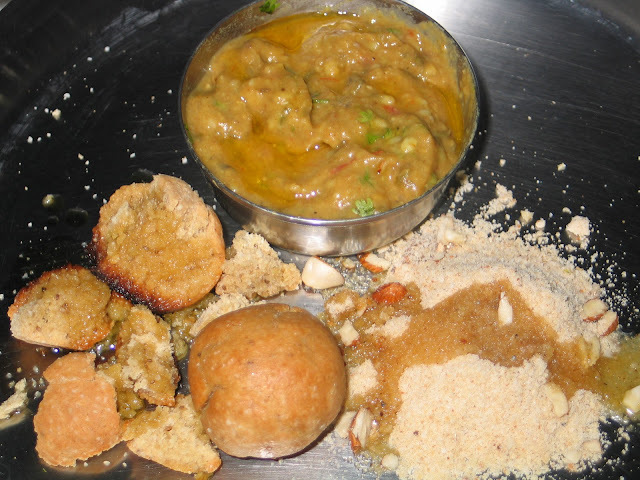 Some kadhis are eaten on their own and some have pakoris or gatte added to them. 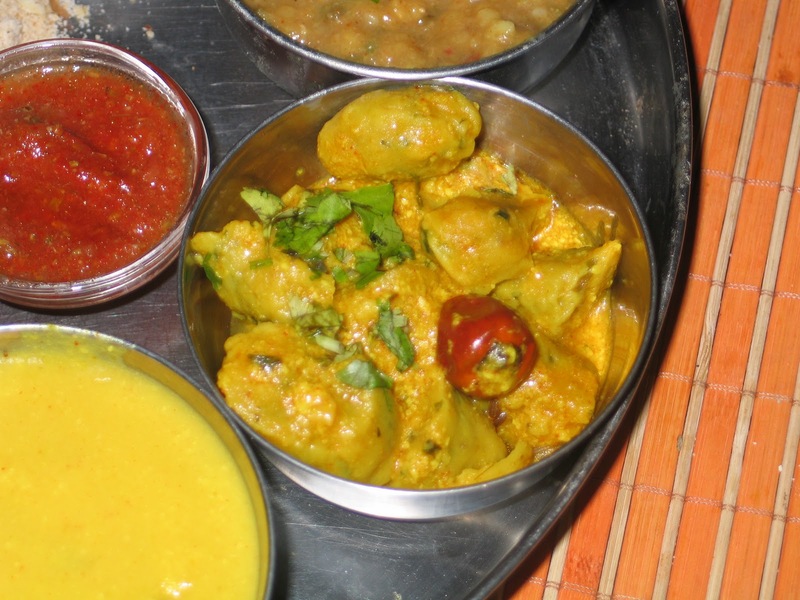 Rajasthani Kadhi has a distinct flavour due to its unique spice mixture with the fenugreek seeds(methi) and fennel (saunf), methi pakoris or gatte may be added to the rajasthani kadhi. Bay Leaf (tej patta) 1 no. In a bowl, add the Bengal gram flour, yogurt, turmeric, red chilli powder and salt and mix well. Add in the ¾ cup of water to this mixture and mix well. In a pan, heat clarified butter, add in asafoetida(Hing), cumin(Jeera), fenugreek(methi), fennel(saunf), bay leaf (Tej patta) and coriander seeds(dhaniya) to the ghee(clarified butter). Fry on a low flame until they change colour. Slowly add the yogurt-spice mixture to the pan and stir well. Allow it cook on a low flame for fifteen to twenty minutes. If the Kadhi begins to become too thick, add in a little more water. The Rajasthani kadhi is a little thicker than runny. Serve with steamed rice or missi roti. Note: You can add methi pakoris to this kadhi. Take one tablespoon Besan, add in a pinch of hing, a pinch of salt, 2 tablespoons of methi greens chopped finely, 1 tablespoon dhaniya greens chopped finely, one cut up hari mirch(green chilli) and a pinch of haldi. Deep fry this mixture into fritters/ pakoris and add into the kadhi. 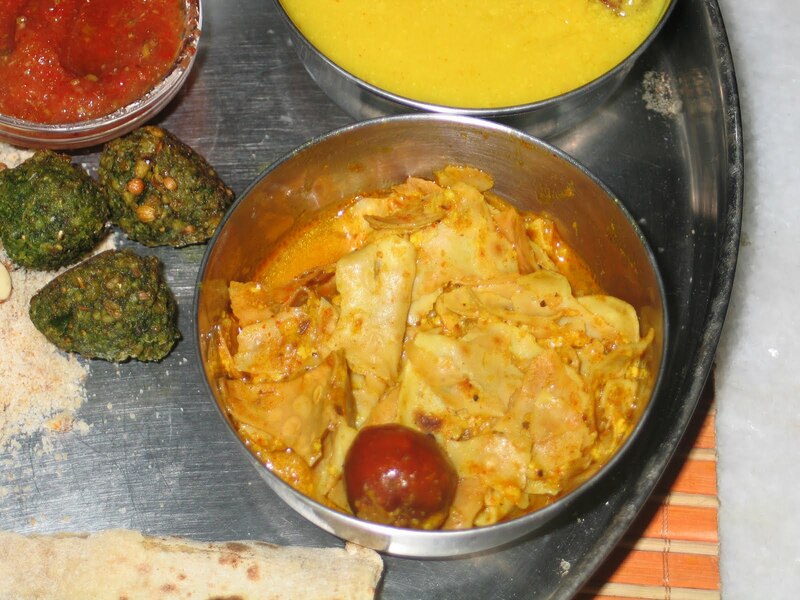 This traditional Gatte Ki Sabzi is a signature dish on any Rajasthani menu. 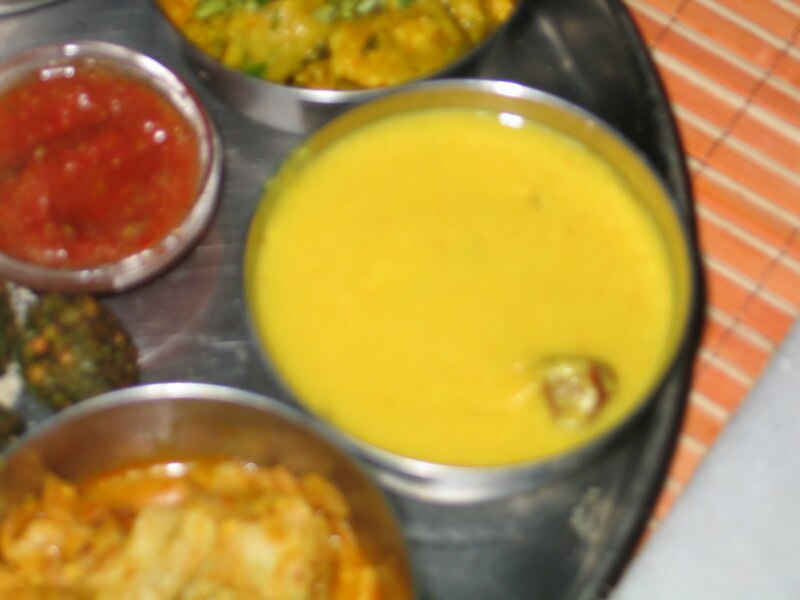 A Rajasthani thali is incomplete without gatte cooked in a yogurt curry. In a bowl, mix gram flour, salt, turmeric, Carom seeds and chopped fenugreek greens (Methi). Mix well. The fenugreek greens are raw and tend to release moisture in the mixture. Make dough with this mixture. If the moisture is less add in a teaspoon of yogurt , add little to avoid forming a sticky dough. Divide this dough in three equal parts. Roll each part between your palms and make the dough a long cylindrical shape. To cook the gatte, dip them in boiling water and allow them to cook for two to three minutes in boiling water. Remove the gatte from the boiling water. Allow them to cool, then cut them diagonally and set aside before adding them to the curry. In a bowl, mix yogurt with a teaspoon full of gram flour and ¾ cup water with red chilli powder, turmeric, coriander powder and salt. Stir and mix the ingredients well. In a pan, heat clarified butter (ghee), once the ghee is hot add in cumin, once the cumin turns a shade darker. Now, add dried red chilli, lower the heat. Now, add in the yogurt mixture and stir. Keep the heat low and keep stirring the curry for three minutes. Add, in the methi gatte , stir and cook for another four minutes on low flame. Serve hot with missi roti. The Classic Rajasthani combination, soaked up in ghee. You will love this marriage! Mix toor dal, urad dal, moong dal, chana dal and masoor dal in a bowl. Soak them for thirty minutes or more. In a deep pan add the soaked pulses and three cups of water with ½ inch piece of ginger, crushed, turmeric, salt and stir. Boil for thirty to forty minutes until the pulses are cooked completely OR cook the dal with ginger, turmeric and salt in a pressure cooker for one whistle, cook for another five minutes on low heat and then turn off the heat. Keep it aside. In a clean pan, heat clarified butter, add cumin, asafoetida, allow the cumin to change colour. Add red chilli, coriander seeds, roast and allow them to change colour. Now, add in the whole spices, cinnamon, bay leaf, cloves, peppercorns and stir. Allow them to change colour, roast for two minutes on medium heat. Grind the spices into a coarse mixture. Add in the chopped tomatoes and tamarind pulp along with the spices into a hot pan and stir. Allow them to cook on medium heat for three minutes, until the tomatoes are squishy and completely cooked. Now, add in the boiled pulses that were boiled earlier, stir and cook for another two minutes. Check for salt, spice and the sour flavour of tamarind. If necessary, mix red chilli powder for pungency and dried mango powder for sour flavour with a tablespoon of water and add it in to the pulses in the pan. Stir. Cook for three to four minutes on low heat. Turn off the heat, then add chopped coriander greens and add it in to the cooked panchmel dal, stir well before serving. For Garnish, add two red chillies to a tablespoon of hot clarified butter. Once it makes a splattering sound, add it in to the panchmel dal in the serving bowl as garnish. Enjoy this spicy panchmel dal with batis and churma. Mix Whole Wheat Flour, gram flour and semolina with ghee and salt in a bowl. Add mix if required and knead it into a hard dough. You can deep fry the batis in hot ghee in a deep pan or bake the batis at 200 degree centigrade or 350 to 400 degree Fahrenheit and then dip the warm batis in a bowl full of warm ghee, until they are soaked in ghee. 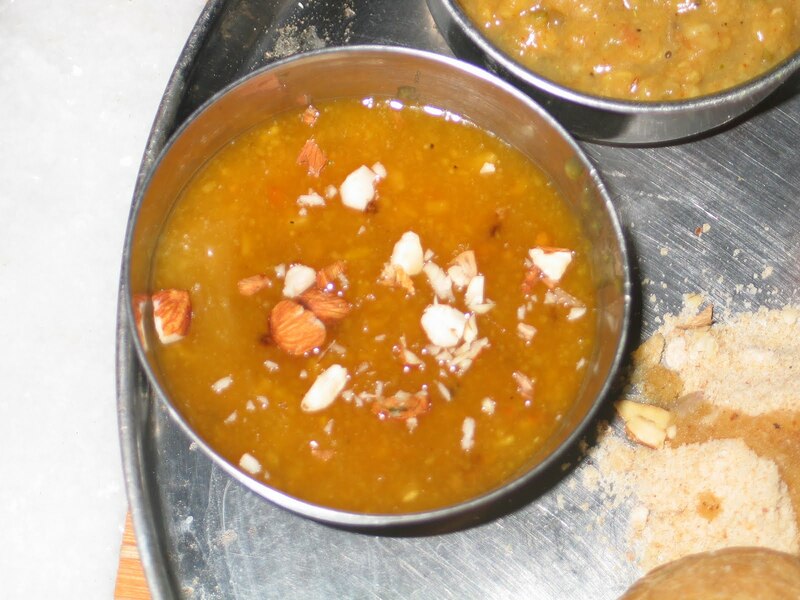 Add 2 teaspoons of sugar and ¼ teaspoon of green cardamom to one baked bati and grind it into a coarse mixture. Add ghee and serve. 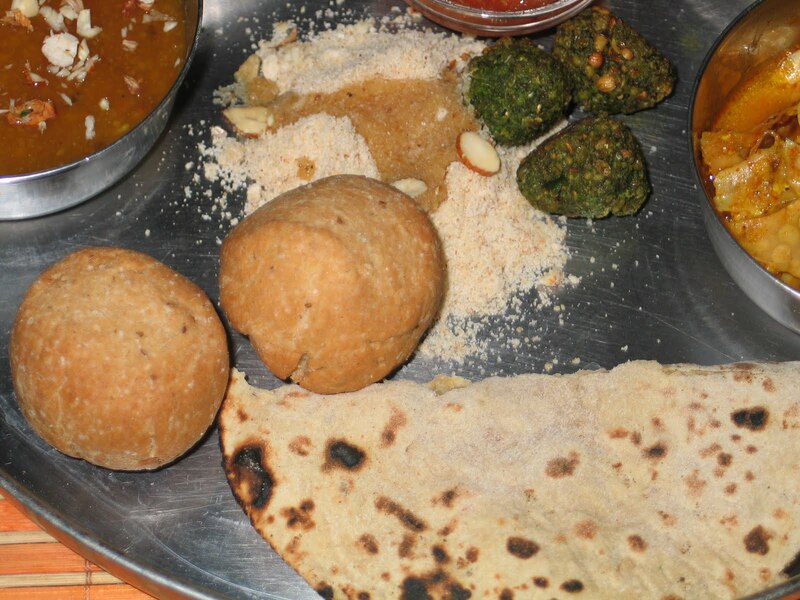 The Rajasthani generally includes Bajra roti or Missi Roti to accompany all the other rajasthani delicacies in the selection. Some prefer to include garlic, turmeric, coriander greens and onion in the missi roti recipe. I have written a recipe with some of the basic ingredients so that the flavour of the missi roti does not dominate the other dishes on the thali. Try this recipe with some onion, coriander and garlic served with lots of butter and you will be begging for more of this flavourful roti. On a flat surface, take whole wheat flour and Bengal gram flour. Make a well in the centre of the dough. Add in Red chilli powder, Coriander powder, cumin, Carom seeds, onion seeds in the centre of the well. Now, add in ¼ cup of water and mix in the spices in the centre of the well. Slowly mix in the flour little by little with the water with the help of your fingers. Make a dough and knead it well with the help of your knuckles for a couple of minutes. Now rub in the salt and the oil and knead it again. Round it up and cover it with a moist cloth. Allow the dough to rest for fifteen minutes. Divide the dough into 10 equal portions and round them up. Place one portion on a clean, flat surface and with the help of a rolling pin, roll out each of the rounded up portions into a round shape, the size of your palm, dust it with some flour if the dough sticks to the surface. Bake these missi rotis over charcoal or bake them on a flat griddle (tava) until they are evenly baked on both sides. Serve hot with butter or ghee. An accompaniment with other items on the Rajasthani thali these lentil fritters with fenugreek leaves have the goodness of pulses and greens. Drain out the excess water from the soaked lentils. Grind all the ingredients, except for the oil, together into a coarse mixture. Do not add any water while grinding since the methi leaves will release moisture when the salt is added to them. Heat oil in a deep pan and once the oil if hot, add one spoon of the mixture at a time and deep fry the vadis. This chutney is an accompaniment to bajra rotis or missi rotis. It is eaten with other items on the thali such as the moong dal vadis. It is a spicy chutney native to Rajasthan. Grind all the ingredients together and serve. When I tried this recipe, I came up with a little trick, I soaked the moong dal, browned it in ghee and then ground it to a coarse paste, this method made my effort come down four folds. Moong Dal Halwa is usually made by soaking and grinding the moong dal and then browning it in ghee. This process is way too tedious because the moong dal paste goes on soaking up the ghee and takes very long to brown and often becomes very heavy. Use my trick and make the halwa in minutes. This sweet from the rajasthani thali is very rich, very sweet and very delicious. Drain out the excess water from the soaked moong dal. Heat Ghee in a pan, add in the moong dal, keep stirring and cook it till its brown. Grind the dal into a coarse paste and blend it in with all the ghee. Set aside. In a deep pan, mix sugar, cardamom powder and equal quantity of water and mix well. Put the pan on medium heat and allow the sugar to dissolve, stir well. Bring the sugar syrup to a boil. Turn the heat on low. Add in the moong dal and stir well. Cook for two or three minutes on a low flame. Turn off the heat. Mix in the pistachio and almonds. Thank you.. Do try it out! Thank you very much admin, I want to have it now after seen your recipe pics. 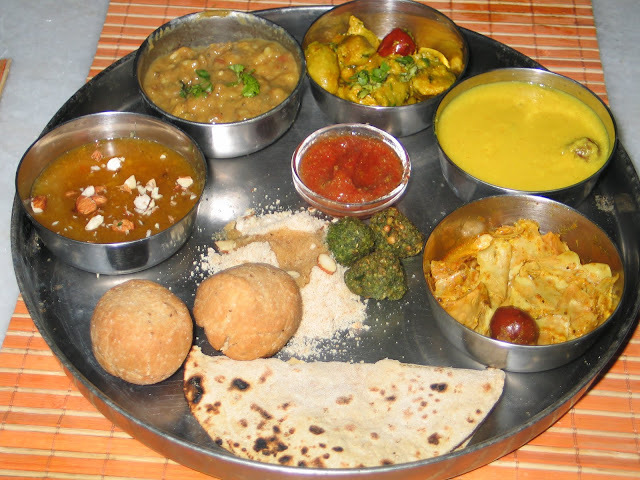 There is a one dish is so famous which is Rajasthani Food Thali .